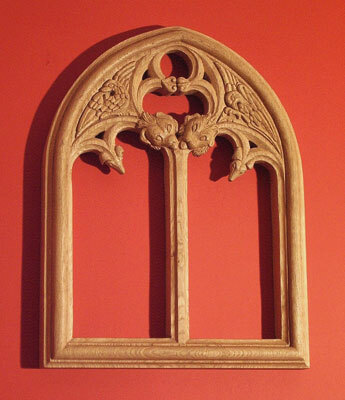 This panel combines the two most significant features of Medieval Gothic - the moulded window mullions and interconnecting curves that form the tracery, and the stylised, often ghoulish, creatures that inhabit it. The origins of this pattern are ecclesiastical. 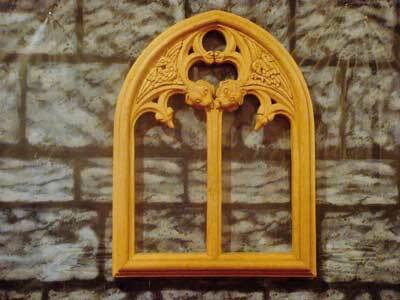 The top section, which I have fitted into a typical 'pointed' window with a central mullion, is a direct copy from Pugin's Gothic Ornament, a collection of drawings of authentic medieval ornament copied mainly from churches and cathedrals in England and France. It was produced in 1828 by AC Pugin - father of the more famous AWN Pugin, shining star of the Victorian Gothic Revival. This panel, with its tracery, dog heads, lion heads and birds of indeterminate species, was drawn by Pugin from the oak original in St. Michael's, Coventry (the old cathedral). 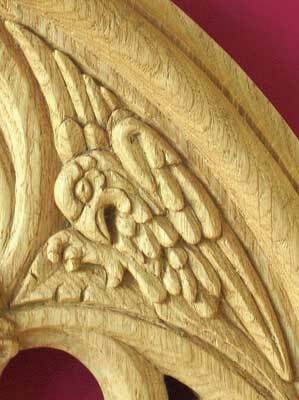 Although it is not clear what species the birds are it would be nice to think they are phoenixes, as all the woodwork in this cathedral was destroyed by incendiary bombs in the great Coventry air raid of 14 November 1940. By recreating the panel in this project we will be 'raising them from the ashes'. 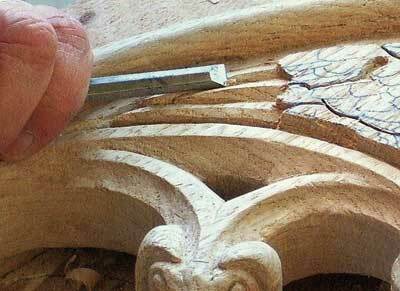 When carving the window frame and tracery you need to be aware of the respective levels of the features. The top level (with the board laying flat on its back) is the convex half-round moulding that forms the perimeter of the window. On each side of this is a rebate, 7mm (1/4in) below the top level. This forms the main tracery level. It sets the level for the centre mullion and the four larger curves that link the lion heads to the side mullions and the top peak of the arch. 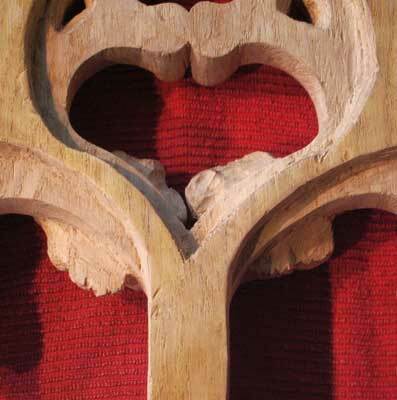 The smaller curves which link to the dog heads and the little 'knuckles' in the top centre are set about 2mm (1/16in) below the level of the larger curves - this is the lower tracery level. Around the arch, the window mullions and the tracery, there is a cove moulding which all ends up at the same bottom level - 15mm (9/16in) below the top of the ridge. A Gothic carving really demands to be done in oak, so prepare a panel of 'green' oak (Quercus robur) of the right size and proportions, in this case 530 x 430 x 50mm (22 x 17 x 2in) thick, and trace the pattern onto the panel (see photo 2). Much of the pattern will need to be redrawn as surfaces are cut down, but it helps to have it all drawn in at the start. Go over the sawing lines in red so you don't get lost with the jigsaw. Cut out the internal voids with a jigsaw (see photo 3), making allowance for the lower end of the saw flexing out on the curves because of the 50mm (2in) thickness. 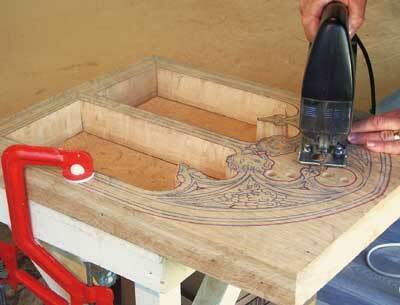 Cut the outside edges with a bandsaw, if you have one, to avoid the flexing problem. With the voids and edges cut out, the boundaries of the pattern are now fixed. Use a marking gauge to mark two lines around the outside and inside edges at depths of 7mm (1/4in) and 15mm (9/16in) from the top face - the main tracery level and the bottom level. 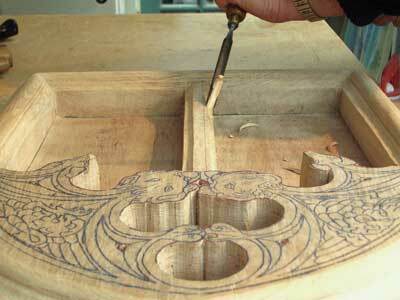 Attach the panel to a backing board by screwing through from the back to secure it for carving. Clamp the board to the bench and move it around as required. With a rebate plane or a chisel, cut a rebate from the edge of what will be the convex moulding down to the first depth line. 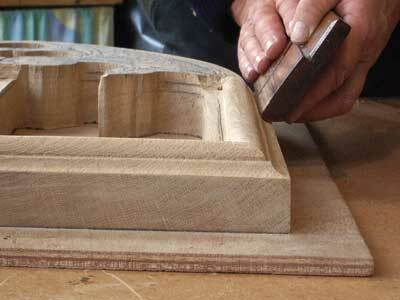 Replicate the rebate on the internal edges using a flat chisel. With a 18mm (3/4in) moulding plane for a convex mould, if you have one, or the inside of a 18mm (3/4in) No.5 gouge if you don't, round off the convex ridge surrounding the arch (see photo 4). Using a 9mm (3/8in) cove moulding plane if you have one, or a 9mm (3/8in) No.6 gouge if you don't, cut a cove around the outside of the arch from the 7mm rebate level down to the 15mm line (see photo 5). 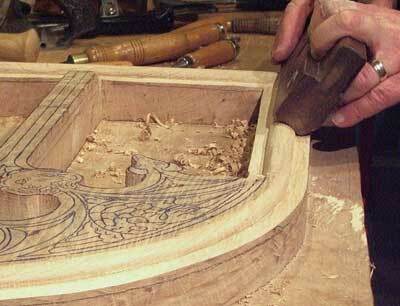 The inside edge of the cove should leave a 2mm (1/16in) shoulder beside the top ridge. Cut the whole surface of the centre mullion - the window bar - down to the level of the 7mm rebate, stopping at the lion heads for the time being. Replicate the cove on the inside edge of the window, including both sides of the centre mullion, using a 9mm (3/8in) No.6 gouge (see photo 6). 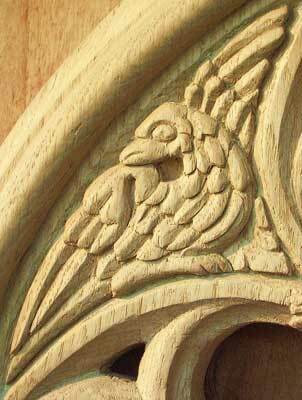 Reduce all the tracery surfaces down to the level of the 7mm rebate - the main tracery level - leaving just the birds, lions and dog heads at their original level for the time being (see photo 7). You will need to draw back in the outlines of the tracery - use crayon rather than pencil so it doesn't make the wood grubby. With the 9mm (3/8in) No.6 gouge and a shallower No.3 gouge, continue the cove moulding from the window mullions round the edges of the tracery, cutting in the triangular 'piercing' between the larger and smaller curves (see photo 8). 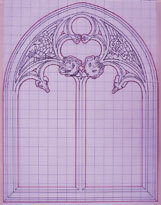 The surface of the larger curves (from the lion heads to the peak and sides of the arch) remains at the main tracery level, but the smaller curves leading to the dog heads and the little 'knuckles' in the middle of the trefoil are cut down to 2mm (1/16in) below this level (see photo 9) so that their top surface merges into the coves of the larger curves. Carve the detail on the little scrolled 'knuckles' in the middle of the trefoil then remove the panel from the backing board and turn it over. Cut away the back surface behind the tracery so it ends up about 25mm (1in) thick, leaving the dog and lion heads untouched for now (see photo 10). This will make the tracery stand out from the wall when mounted and will make it look lighter. With the tracery phase finished, we move from architectural forms to life forms. We have three pairs of part-real, part-fantasy, creatures - dogs, lions and birds. A point to remember with the creatures is that the pairs are not identical - one dog has its ears down and the other has them swept back. With the birds, although their bodies face towards the centre from each side, they both have their heads facing to the left of the panel - one looking over its shoulder and the other apparently pecking at its foot. The lion heads are more similar, but their manes and ears are slightly different. 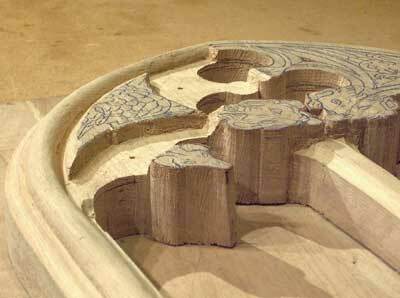 As with the tracery stage, you need to be aware of levels when carving the creatures. 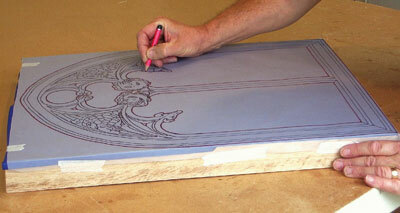 We finish the tracery stage with the 'creature sections' still at the original level of the board surface. 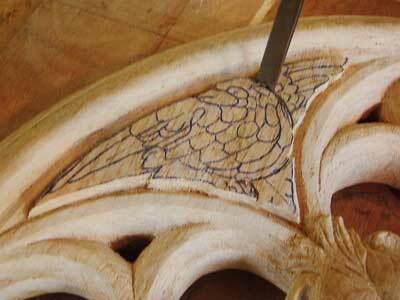 The surface of the dog heads and the birds needs to be brought down to 3mm (1/8in) above the main tracery level. 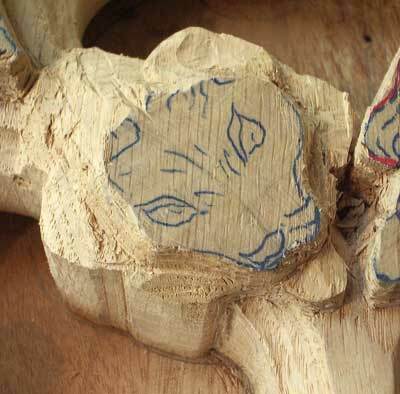 Retrace the pattern on the bird sections - you can redraw the dog's features by hand. The lion heads are left at the original board level - this is so they can lay over the top of the centre mullion where it curves into the tracery. The heads have to be given the appearance of sloping backwards so that the tongues loll onto the surface of the mullion and the manes at the back end flop over the large curves, which are at the same level as the mullion. This gives the lions a distinct forehead, eyes and nose that appear to face towards the viewer. The birds are presented differently from the lions and dogs in that they are in a low-relief triangular panel. 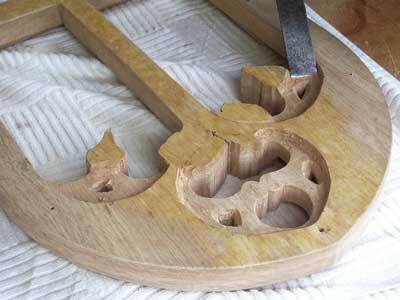 The edges of the panel form part of the tracery and are chamfered in. Some parts of the bird sit above the level of the tracery, and some are incised below it. The feathers need to be bold and angular - not soft and feathery - or they will not cast the shadows needed to make them visible from a distance. Pugin's drawing shows them looking slightly menacing and primeval. 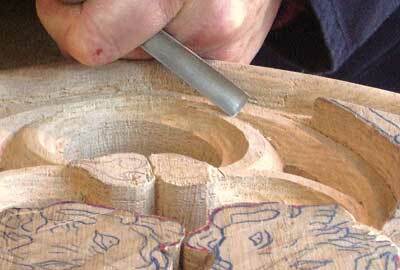 We start the left-hand dog head by cutting the top surface down to 3mm (1/8in) above the level of the tracery curves that the head is joined to. Redraw the pattern with crayon and shape the cove of the tracery into the back of the head behind the ears (see photo 11). 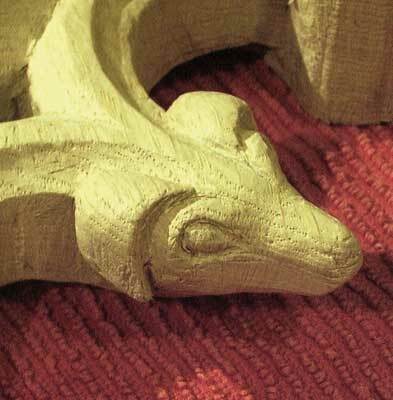 Shape the ears into the tracery, form the area behind the eyes, then form the eyes, nose and forehead (see photo 12). Dismount the carving from the backing board and carve away the underside so that the dog's mouth and throat curve into the underside of the tracery (see photo 13). Repeat the process for the right-hand dog, which has its ears swept back (see photo 14). 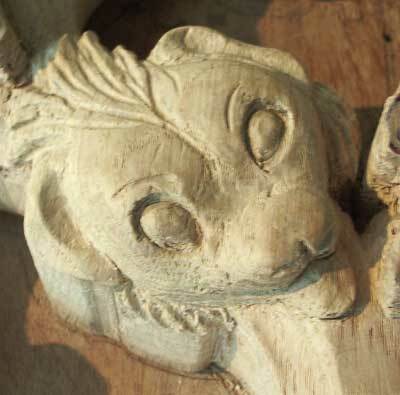 Starting with the left-hand lion head, and leaving the face untouched at present, reduce the levels around the face so that the mane slopes back towards the tracery, the ears and side whiskers are at about the level of the tracery, and the tongue - about 3mm (1/8in) thick - is laying on the centre mullion (see photo 15). 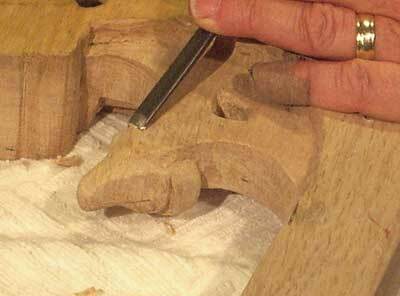 Mark in the eyes and start to shape the face by cutting a groove across between the nose and eyes, and a smaller groove in the forehead between the eyes. Round the sides and back of the head towards the ears and mane, and shape the nose and mouth. Hollow the ears with a 3mm (1/8in) U-shaped gouge, carefully shape the tongue, then give the mane and side whiskers a 'hair' texture with a fine veiner, parting the ends of the 'hair' with a V-tool. Put in 'eyebrows', and a split in the nose curving to both sides of the mouth, also using the veiner (see photo 16). Repeat the whole process for the right-hand lion head. With the carving of the heads finished, dismount the carving from the backing board and turn it over, as we did for the dogs. 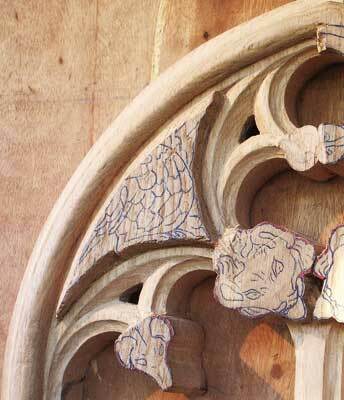 Shape the underside of the lion heads into the underside of the tracery as illustrated in photo 17. 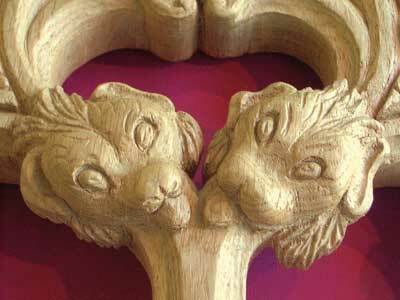 The two finished lion heads (see photo 18) are very similar except for differences in the mane and ears, all copied exactly from Pugin's drawing of the original. 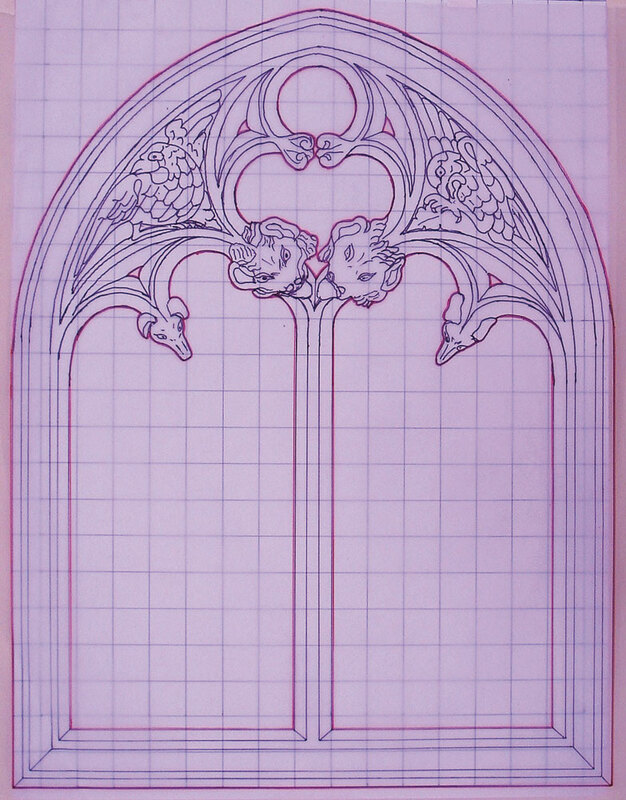 With the surface of the bird panels cut down to 3mm above the level of the main tracery curves and the pattern re-traced, start the left-hand bird by 'bosting' round the edges of the pattern and chamfering the edges of the tracery into the panel. Bost around the body where it meets the upper wing and the leaf (see photo 19). 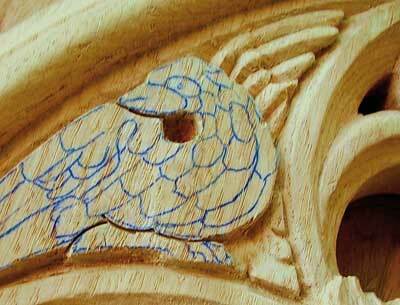 Carve the detail on the upper wing and the leaf (see photo 20) and repeat the process on the lower wing. 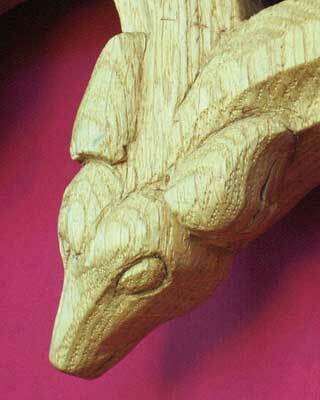 Create angles on the feathers to give some shadow using a 6mm (1/4in) flat chisel (see photo 21) that is sharp enough to handle cutting against the grain where necessary. Complete the lower wing and the foot. 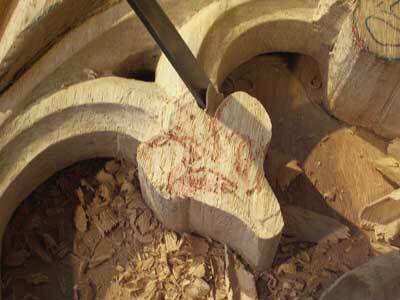 Cut a deep hollow under the bird's throat and shape the 'shoulder' so the beak can lay over it. Finish off the body feathers, rounding the body at the edges. When the left-hand bird with its alert stare is finished (see photo 22), repeat the process for the right-hand bird, which looks rather more sinister with its head down and its 'shoulder' hunched (photo 23). "A point to remember with the creatures is that the pairs are not identical"